A deep, steep-walled gorge carved by a river, thick vegetation, rock outcroppings, and waterfalls characterize Lehigh Gorge State Park. Whitewater boating and biking are popular activities. 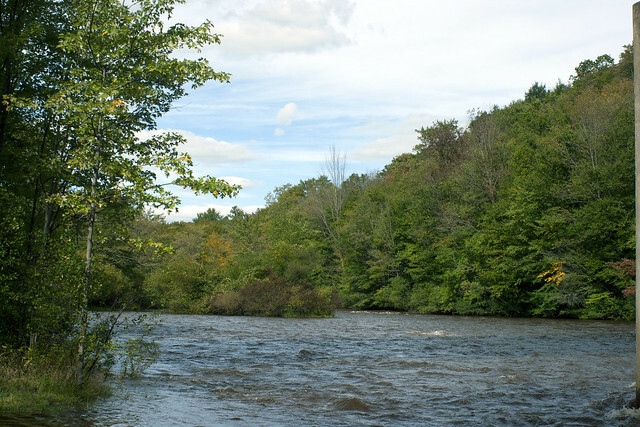 The 6,107 acres of park land follow the Lehigh River from Francis E. Walter Dam in the north to Jim Thorpe in the south. The Lehigh Gorge Trail follows more than 20 miles of abandoned railroad grade along the river, providing opportunities for hiking, bicycling, sightseeing, and photography. The trail is closed to motor vehicles. Parking areas are provided in White Haven, Rockport, and Glen Onoko. Very limited parking is available at Lehigh Tannery but boat launching is prohibited. Contact the Hickory Run State Park office for facility seasons and hours. White Haven is the northern access area and can be reached off Exit 273 of I-80. Take Exit 273 off I-80. Follow PA 940 west for one mile then turn left onto Lehigh Gorge Drive. At the village of Rockport, turn left onto Rockport Road. Glen Onoko is the southern access area and may be reached by taking Exit 74 of the Northeast Extension of the Pennsylvania Turnpike. Take a group of friends for a bicycle ride (or a hike) along the river on the Lehigh Gorge Trail. Challenge yourself with a whitewater rafting trip. Experience the wonder of the Upper Grand Section of the Lehigh Canal by standing inside Lock 22 at Mud Run. Enjoy the view from the top of the Inclined Planes at Penn Haven. Snowmobile the 15-mile trail from Penn Haven to White Haven. Eat a picnic lunch to the beautiful sounds and sights of Buttermilk Falls. Explore the Audubon’s Lehigh Autotour. Photograph beautiful rhododendron along the Lehigh Gorge Trail in July. Find your own secret fishing hole in the nearly 30 miles of river or its numerous tributaries. Visit a neighbor -- Hickory Run State Park! A wide variety of environmental education and interpretive programs are offered year round. Through hands-on activities and guided walks, participants gain appreciation, understanding, and develop a sense of stewardship toward natural and cultural resources.